Expert Tips From Nickola Wolf Nelson, Ph.D. Looking for a new way to support students with dyslexia? Check out the Test of Integrated Language & Literacy Skills™ (TILLS™), a new assessment designed to screen and diagnose language & literacy disorders-including dyslexia. As teachers, when we see a student struggling with what we think may be dyslexia, we immediately want to help. But understanding what’s going on with a student’s language-based learning disability isn’t simple. Dyslexia takes different forms, and what works for one child doesn’t necessarily work for another. 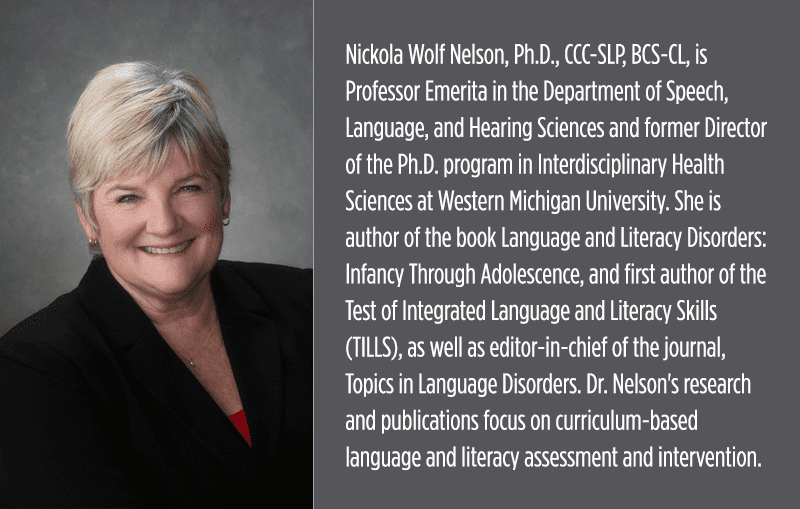 We asked Nickola Wolf Nelson, Ph.D., lead developer of the new Test of Integrated Language & Literacy Skills (TILLS) and professor emerita in the Department of Speech, Language and Hearing Sciences at Western Michigan University, to share her best tips for understanding students who have dyslexia, plus techniques for supporting them in the classroom. 1. Dyslexia is a language-based learning disability. It’s not a vision problem. It’s not about intelligence. It certainly isn’t about laziness. It affects the way the brain processes written and spoken language. Nelson says people with dyslexia have trouble mapping letters onto sounds and vice versa. Students with dyslexia usually have a hard time reading, but they can also struggle with spelling, writing and even pronouncing words. Nelson notes the two key components of reading—word structure knowledge and language comprehension—and makes these points: “Word decoding without comprehension isn’t reading” and “Making up meaning without accurate word decoding is not reading.” She says, “If either one of those pieces is defective, it’s not going to work.” Nelson explains that children with classical dyslexia generally have good language comprehension skills when they’re listening. It’s when they’re reading, she says, that these students struggle with word structure knowledge, which affects their ability to decode and spell, and it may also interfere with their ability to understand what they read. 2. Dyslexia is hereditary and lifelong. Dyslexia is not a phase or something you outgrow—although it may appear differently at different points in development. Often, a child’s diagnosis will trigger parents to realize that they too have dyslexia. Their children’s symptoms are all too familiar. “It’s lifelong, and they will always expend more effort, but that doesn’t mean people with dyslexia can’t learn—or that they can’t enjoy reading,” says Nelson. 3. Dyslexia is more common than many people think. The International Dyslexia Association estimates that as many as 15 to 20 percent of people have some symptoms of dyslexia, such as trouble with reading, spelling and writing, or mixing up similar words. It affects people from all types of backgrounds too. Of the 13 or 14 percent of school-age children who have a condition that qualifies them for special education services, 7 percent are diagnosed with a learning disability. And 85 percent of those children have a primary learning disability in reading and language processing. Nelson recommends providing explicit instruction in sound-letter associations to all students (e.g., teach them to identifying word parts like -ed and -ing) and in reading, decoding and spelling. She says that all children can benefit from this type of instruction, especially in the early grades, and that those children, including those from diverse backgrounds, who struggle to learn despite this instruction may have dyslexia. 4. Before school starts, dyslexia may not be obvious. When bright students continue to make the same mistakes over several days, and they can’t seem to make a connection between sounds and letters, a red flag often goes up for teachers. Nelson emphasizes that teachers have a very important role because they’re on the front lines when it comes to identifying dyslexia. She says teachers should follow their gut when it comes to screening students for dyslexia. When you see them struggling to remember sound-symbol combinations, Nelson advises, it’s time to take action. 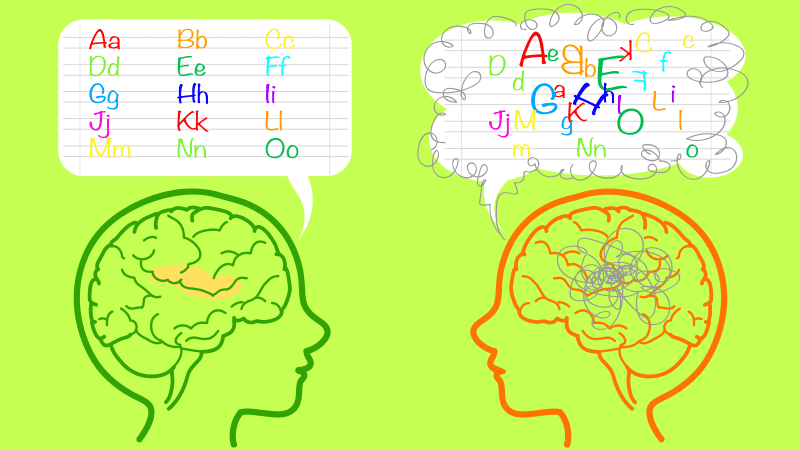 Children are generally diagnosed when they learn to read, in kindergarten or first grade, but if you suspect dyslexia in older students, it’s still a good idea to request assessment since the condition sometimes isn’t identified until much later, and early identification and treatment can make a big difference. 5. There isn’t a one-size-fits-all solution. Some children who have reading, decoding and spelling problems consistent with dyslexia may not actually have dyslexia. “There are other language problems that can cause trouble with reading that also deserve attention in school,” says Nelson. Educational teams can use tools like the Test of Integrated Language and Literacy Skills (TILLS), of which Nelson was the lead developer, to help figure out what individual students with language or literacy problems need to succeed in your class. Nelson also recommends that teachers involve parents, and even students with dyslexia themselves, in making plans for academic success. The Student Language Scale (SLS), a short 12-question screener, can be used with the TILLS as a tool that teachers can fill out themselves and also send home for parents and students to fill out before parent-teacher conferences. “This input about how parents and students feel about their literacy and language skills can be very helpful to teachers,” says Nelson. 6. It isn’t as simple as it may seem. 7. For students with dyslexia, some words and activities are harder than others. The words children with dyslexia find most confusing may not be the ones you’d think. Often it’s the short, common words that seem easy to most students—such as from, of, the, to, for, what, that, where, who, and how—that are tricky for students with dyslexia. Sometimes when students with dyslexia see a list of these seemingly basic words on a test, they just freeze up, says Nelson, so it’s helpful to teach them to pay attention to the letter-pattern cues that make these words different from one another. They also may need to be encouraged to try multiple pronunciations of long and complex words in later grades because they may have trouble initially putting the accent on the right syllable or saying the vowels correctly. In the classroom, also try to avoid putting a student with dyslexia on the spot to read aloud in a round-robin situation, which can be particularly embarrassing. A better option is to have the whole class read in unison, suggests Nelson. These choral readings model fluent reading and give students with dyslexia an opportunity to join their peers. While Nelson doesn’t advocate for old-fashioned, round-robin readings where individual students are put on the spot, she does say it’s important for teachers, especially those working with young children, to listen to their students read aloud on their own from time to time. Some children with dyslexia are very good at hiding their disability in a group setting, so it’s not until you sit down one-on-one to listen to your students read aloud that you’ll notice a problem. 8. Use accommodations wisely but sparingly. Tasks that become automatic and fast for most people can take a lot of extra effort and time for people with dyslexia, so many children with dyslexia need extra time to do their assignments, says Nelson. It may also help to assign fewer problems so homework doesn’t become nightmarish. Some students have an easier time with comprehension when they hear you read instructions aloud, or they may comprehend more by listening to an audiobook instead of reading from a physical book, because auditory memory may be affected along with reading. When giving instructions orally, Nelson says it helps to write key information, such as page numbers and problem numbers to be completed, on the board. “Use accommodations wisely but sparingly,” suggests Nelson. For instance, if someone else always reads for and scribes for a student with dyslexia, the student may become increasingly dependent on others. In addition to using accommodations, Nelson recommends that students with dyslexia receive direct, explicit instruction by someone who has keen knowledge of dyslexia and that they are encouraged to read on their own for intervals that get longer as they age. She says this should be material that the student helps to identify and that is fun and rewarding. 9. Strategies that work with students with dyslexia help all students. Try universal strategies to help all students pay attention to the structure of words, sounds and patterns, which Dr. Nelson says can also be especially useful to students with dyslexia. In early grades, ask the class to say a word slowly and pay attention to how the individual sounds feel in their mouths and sound in their ears and brains, so they can write the letters that make those sounds. Then go backwards by starting with a series of letters and then saying the sounds they make. As students get better, swap out letters and remove those sounds and substitute others. Use nonsense words at first to teach the code. Make it a game. Then use real words, suggests Nelson. In later grades, help the class focus on the structure of complex words related to math and science, such as Greek and Latin morphemes in words like geology. You can model how to break words into parts (syllables and morphemes) and spell one part at a time with words such as trigonometry and geometry, or hypertension and hypotension. 10. Giving encouragement to students with dyslexia can truly make their day.